Wilderness on The Lake in Wisconsin Dells is part of the Wilderness Territories Resort Complex. This deluxe lodging destination is a premier condominium resort that takes advantage of proximity to the thrills and adventure of the Dells while offering its own great water park facilities with large indoor and outdoor water parks, golfing, zip-line-tours, horseback riding, spa facilities, nature trails and more. The Wilderness on the Lake features beautifully appointed rooms with full amenities, lake view units, a private beach, infinity pool and fire pits and access to all the Wilderness Territories water park and entertainment facilities. Want more Wisconsin Dells hotels? Choose below! Hey, hope you're enjoying your stay here at Wisconsin Dells Hotels. 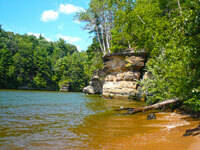 We created this site because we love Wisconsin Dells. Now, our quest is to provide you with the most relevant and helpful information on the web about Wisconsin Dells hotels – including lodging reviews & more. Plus, you can find out about Wisconsin Dells top attractions, best water parks, favorite restaurants, and much more. All in easy to read guides. Enjoy!